Q: Exactly what is SlingShot? A: SlingShot is a small, lightweight, and cost-effective system that enables Beyond Line Of Sight (BLOS) Communications On The Move (COTM) on in-service tactical radios using a global commercial satellite network provider. 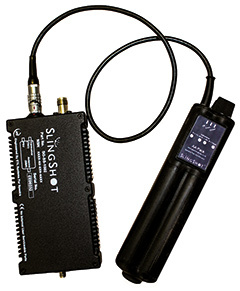 A: The SlingShot system consists of an Applique, an omni-directional L-Band antenna and a power supply unit. The radio operator removes the VHF or UHF antenna from their tactical radio and uses the provided cable to attach the Applique. The applique converts the radio signal to satellite L-Band frequency via the antenna. A tactical net is instantly transformed to cover 100s or 1000s of kilometres between SlingShot enabled radios, without the need for land or air-based repeaters. Q: In a world in which modern warfare often means greater complexity, the technology offered to the modern soldier is also often increasingly complex. Your product, SlingShot, claims to offer solutions without adding complexity, how does it manage that? A: First, the simplicity. It takes a minute to enable the tactical radio with SlingShot. Once the satellite channel has been booked, the operator programmes the radio to the correct frequencies and attaches the SlingShot system. Training is very quick. An operator can be fully trained on SlingShot in half a day and an engineer in one day. The SWaP profile is also very low. The manpack system can weigh less than 1.5kg (3lbs) including the antenna, and is designed to use in service radio batteries or AA Batteries for power. Once connected it delivers both BLOS and COTM capabilities at a tactical level which has long been a difficult-to-solve problem for Command and Control (C2). The AA Battery Cassette offers a straightforward and lightweight back-up power supply for SlingShot. Q: Why is it important to have BLOS and COTM for Tactical Radios? Forces have managed so far. A: Engagements have changed. Operations are increasingly asymmetric and non-linear. In order to maximise effectiveness, C2 needs systems that allow rapid response to changes as they occur. Whether the forward units are SOF , conventional or Joint Forces, if they are operating BLOS there needs to be a tactical communications solution to maintain C2. There are many reasons for this; to ensure continuous flow of targeting information; to provide adequate support and to provide rapid coordination and flexibility are some. Traditionally this has been achieved by utilising ground repeaters, air repeaters or UHF TACSAT. Each has its own drawbacks compared to SlingShot. Ground repeaters become, in themselves, a target and need protecting, utilising scarce resources and increasing risk. The cost of keeping air repeaters in service 24hrs/day is very high and they are not 100% reliable due to the potential effect of adverse weather conditions. UHF TACSAT is also expensive but, more importantly, is a very limited resource, only available to the highest priority missions and, due to the limited capacity, is not a flexible or responsive option. Beyond that, it also does not deliver effective COTM, with the operator needing to pause and locate the satellite whilst communicating. Because SlingShot utilises a global constellation of satellites and omnidirectional antenna, the radio can be used at speed and it doesn’t matter at which direction the operator is moving. Q: Who is using SlingShot? A: SlingShot is in service with many units across the NATO partnership in various roles from Land Operations to Amphibious and Aviation tasks. It has been described on more than one occasion as a “battle-winning capability” and exactly where it is being used is therefore not for us to say. We can say that in the past 12 months, there has been a large take-up by armed forces and government agencies across the globe. Q: Which type of agencies are using it? A: SlingShot delivers secure voice and data BLOS COTM and so can be of use to many different types of agency. SOF; Expeditionary Forces; Emergency Services, Intelligence Agencies, Border Protection, Coastguard, the list goes on. Q: What kind of data bandwidth does SlingShot handle and how does it secure it? A: A SlingShot satellite channel is 25 MHz L-Band, so the bandwidth wouldn’t support high definition video but then that is not available from a tactical radio anyway. However, for tracking, artillery fire plans, biometric analysis, email, file transfer, and chat/free-text it is fine. Because the channels are non-contended there is also a quality of service that cannot be guaranteed by other options. In terms of security, the SlingShot system converts the radio signal to L-Band, including the waveform. So crypto is passed through the system untouched. Q: You mentioned Joint Forces, how does SlingShot work if forces are using different radio systems? A: The beauty of SlingShot is that it is radio agnostic. 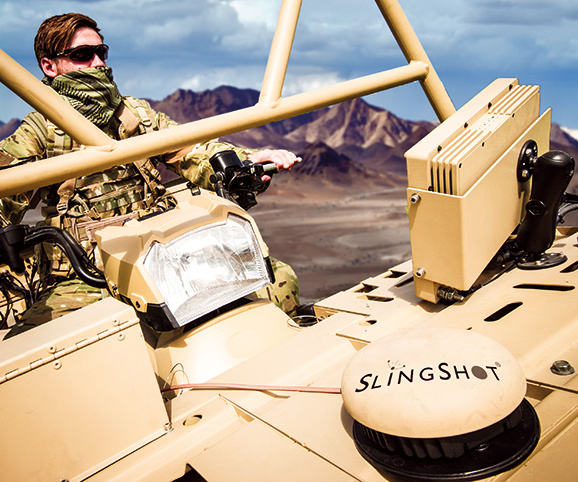 As long as the radio falls within the supported VHF or UHF frequency range (58-88 MHz and 240-311 MHz military and 144-174 MHz VHF Commercial), and that includes nearly all in-service tactical radios, SlingShot will convert it to L-Band at which point it is effectively a ‘SlingShot Radio’. That means that interoperability becomes a reality. Whether forces be from different agencies, be airborne, land or maritime or even from different nations, they can all join the same net. Where combined joint fire support and manoeuvre relies on unity of effort and synchronisation of capabilities, SlingShot adds massive benefit.